Scarlett learned to sing "Rudolph the Red-Nosed Reindeer" at preschool, so she was very happy when our day to read Rudolph rolled around. We asked Scarlett to read it to us, but she sang it to us instead. 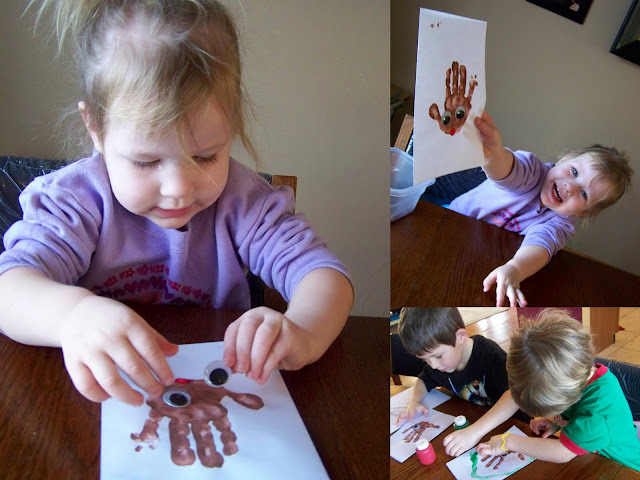 We made these hand-print Rudolph cards to go with our "reindeer food". Don't worry, it's ok for humans to eat too...and lots of it. In a very large pot over low heat, melt peanut butter and chocolate chips, stirring frequently. Remove from heat and add cereal, stirring gently to coat well. Add the powdered sugar, a bit at a time, and continue stirring until mixture is completely combined. Spread pieces on a cookie sheet or other clean, flat surface, separating them so they don't stick together. Allow to cool. Store in airtight container until ready to serve. Makes about 12 1-cup servings. lucky reindeer-fun idea as usual! Yum! Our "reindeer food" is actually "food" we put out on the lawn to give Santa and his reindeer a landing path to our house Christmas Eve. It is a mix of green and red glitter and oats. The reindeer see the glitter and it guides them to our house, and the oats are a treat for them. Cute idea Glass of Whine! I've always had that recipe with chex cereal and called it muddy buddies. I wonder what the difference is in taste. I think I need to go to the store now. My only problem with this is that I will eat it all before the reindeer come. I would have to make it the night of :) YUMMERS!! Reindeer food will be a big hit with my grandkids. And best of all...IT'S EASY! we always make this and call it puppy chow. i guess whatever it is, it's delicious!